In the Princeton Review’s 2015 ranking of Green Universities, UCSB was declared first out of public universities and third out of all universities. Green Universities are those considered to be environmentally aware, conscious, and active. Since then, UCSB has consistently been within the top 25, cementing itself as a university that values sustainability and environmentalism. From past awards to future projects, UCSB has long been driven for a greener tomorrow. The Santa Barbara Channel oil spill of 1969 was a catalyst for UCSB’s journey toward sustainability. In response to the spill, a faculty group called The Friends of the Human Habitat formed to combat the damage being done to the ocean by such catastrophes. From then on, UCSB has been advocating for the environment. The undergraduate environmental studies program at UCSB was formed in 1970, shortly after the oil spill. Today, the program has more than 850 students and 7,200 alumni — powerful numbers for an undergraduate program of this type. Bren Hall, the site of the Bren School of Environmental Science and Management, was designed by students and faculty to be a structure optimized for sustainability. It achieved the U.S. Green Building Council’s Platinum LEED score for its sustainability, not once, but three separate times. In 2017, it became the first laboratory building to receive this level of recognition three times, contributing to its certification as the nation’s greenest laboratory. Markers of UCSB’s sustainability are not just limited to the academic sphere — they’re everywhere. Almost half of UCSB’s students bike for their daily commutes, a transportation method enabled by 10 miles of bike paths on campus. Many students who don’t bike often use the bus system, which reaches most student residences and housing complexes. There are also a variety of other options for students seeking a greener commute that may not be able to take the bus, such as carpooling or walking. UCSB’s transportation services use alternative fueling in about 40 percent of their vehicles — including electric, hybrid, and compressed natural gas methods — and that number is projected to increase with time. UCSB’s commitment to sustainable transportation is vital to the environmentalist cause. According to the EPA, transportation makes up 28 percent of our greenhouse gas (GHG) emissions. Their data also shows that electricity is an impactful GHG producer, accounting for 28 percent of our total emissions. From 1999 to 2014, UCSB has lowered its electricity and natural gas use per square foot by 30 percent and 17 percent, respectively. In 2014, UCSB had 10 operational solar panel arrays, and more are in the works today to further the goal of lowering emissions. All these projects support the UC Carbon Neutrality Initiative, which promises that all UC infrastructure will emit net zero GHG emissions by 2025. UCSB has reduced GHG emissions by 19 percent since 1990, despite construction doubling its area. 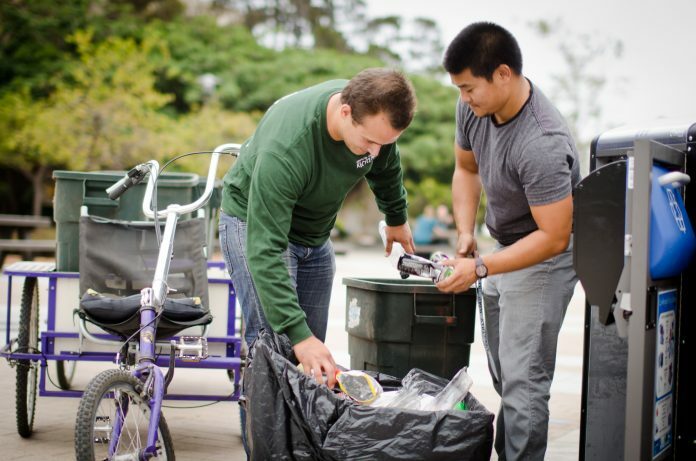 Some of UCSB’s other sustainability objectives, like Zero Waste by 2020, aim to divert waste from landfills. Groups like A.S. Recycling and the Refuse and Recycling Research Center have been pushing forward projects to improve campus waste management since 2004. They have approached this goal, with a 50 percent waste reduction by 2008 and nearly a 75 percent reduction by 2012. Meaningful environmental initiatives assisted in this journey. The Compost Pilot Project, for example, is responsible for the compost bins scattered around campus today. The subject of sustainability is not a common consideration when students think about choosing a university, but it is becoming more important in political and public spheres. For students, the choice of school can be political as well as economic; it can be the first step of becoming who they want to be. Issues they care about — whether they are local, national, or global — should not be ignored. The strides UCSB have taken are important, but more action is needed. Despite offering 4,867 courses, under six percent include sustainability as a topic. The fight for the environment is the fight of today, and it will affect all people, regardless of their careers. The school’s curriculum could reflect this awareness in the way its sustainable infrastructure already has. UCSB students will be out in the world before long, armed with the capability to change the world. The more education on sustainability they have, the more sustainable the world’s future will be.